SkyFrog Tree Services in Gainesville, FL provides experienced, trusted tree removal services in the greater North Central Florida region. Whether you need a tree removed from your residential or commercial property due to safety concerns, recent storms, or to clear the area, call SkyFrog! We take the necessary precautions to ensure you, your property, and our team are safe during the entire tree removal process. Don't trust just anyone — call our Gainesville arborists today for a free tree removal estimate. Trees are valuable assets to our landscapes, and we prefer to maintain them for preservation whenever possible. However, removal is sometimes necessary. Don’t trust just anyone with your tree removal-make sure that the arborist is properly trained and certified. Tree removal can be a very complicated process that requires knowledge, experience, and training to safely and successfully execute. Some trees are simple to remove, others require specialized equipment like bucket trucks and cranes. Skilled arborists can recognize the subtle aspects of trees and sites that will determine how simple or complex the removal will be. SkyFrog’s arborists are trained and equipped to ensure a safe and proper tree removal while minimizing damage to surrounding property, trees, and landscapes. When Is It Better To Remove A Tree? Generally, when leaving the tree poses a safety risk to people and property. But this doesn’t mean it’s an easy decision to come to. The cost of tree removal plays a significant role in the decision, since certain types of trees require more work to remove than others. Many people develop emotional attachments to trees over time and may be hesitant to remove them. Arborists with SkyFrog Tree Service can thoroughly inspect a tree and provide guidance on whether to remove the tree or leave it in place. Contact us today to schedule an appointment or for more information about our tree care services in Gainesville, FL. Can Restorative Care Save My Tree? Decay, usually as breakable and soft wood and mushroom-like spores. Restorative care is a tree service Gainesville residents know SkyFrog Tree Service excels in. Our team creates a treatment plan and uses a combination of tree care techniques to resolve health and/or structural issues. However, not all affected trees can be saved and our arborists will let you know if a tree on your property will need to be removed. The decision to remove a tree isn’t a knee-jerk reaction. The arborists in Gainesville with SkyFrog Tree Service weigh numerous considerations before making a final decision. These considerations and factors include the following. Trees located near power lines may need to be removed if their mature height surpasses 25 feet. Along with power lines, tree removal may be necessary for trees that are too close to homes and buildings and may eventually cause damage. The surrounding environment is a crucial element in determining whether a tree needs to be removed or can be left in place. Common in Florida, trees near bodies of water usually have shallow root systems. Shallowness affects each tree’s ability to withstand high winds from hurricanes and tropical storms without toppling over. New construction in the surrounding environment may reduce or block necessary levels of sunlight or expose the tree to too much sunlight. Then, new construction often causes grade changes and soil compaction, both of which affect the tree’s short- and long-term health. The structural stability of a tree lies in the root system and trunk. If a tree is leaning, it’s a sign the root system is broken and unable to support the tree. If you have a tree that leans more than 15 percent, call SkyFrog Tree Service for immediate tree removal Gainesville, FL, home and business owners can depend on. Trunk damage doesn’t always require removal but if 25 percent or more of the trunk circumference is damaged, removal is necessary. If the trunk has dead branch stubs, large wounds, seams, and vertical cracks, these are signs of internal decay. Tree history includes previous pruning jobs and any changes to the soil level covering the root system. Both factors affect the health of a tree and can quickly stress and weaken healthy trees if not properly addressed in a timely manner. Florida-friendly trees need less maintenance and tend to handle the subtropical climate much better than non-native trees. If you have questions about what Florida-friendly trees make good additions to a commercial or residential landscape, contact a Gainesville arborist with SkyFrog Tree Service. Similar to sugar maple trees found in the Appalachian mountains, the Florida sugar maple is smaller in size but provides significant shade with a dense, round crown. The tree grows in moist soils or on limestone ridges along a coastal plain. 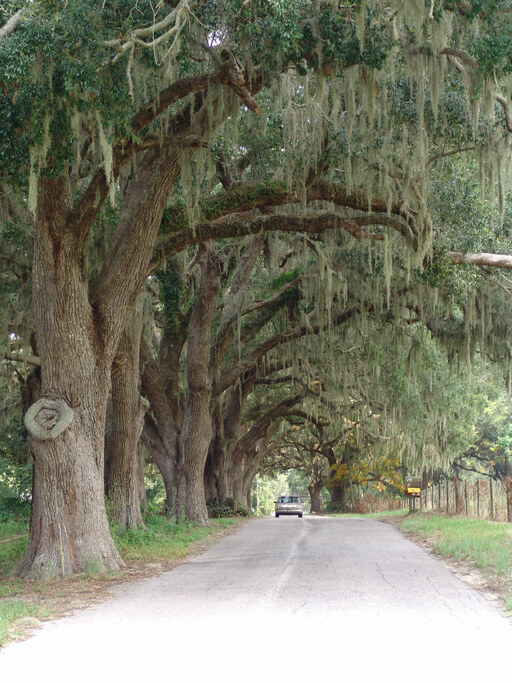 Live oak trees provide shade in many rural and urban settings with a low and dense crown. These trees can grow to 50 feet tall and feature massive, wide-spreading limbs. Longleaf pine trees can reach 100 feet at maturity and feature orange-brown, coarsely scaled bark. It generally grows on coastal plains where the surface is flat and soil gravely and/or sandy. Southern magnolias are a staple throughout Florida and most of the southeastern United States. This tree generally matures between 60 feet and 90 feet tall with a trunk two feet to three feet in diameter. Southern magnolias are known for their fragrant and large white flowers. The importance of doing thorough research on a tree before planting it cannot be understated. SkyFrog Tree Service can help you choose an appropriate species for your landscape while avoiding trees that simply aren’t worth the hassle, such as these four. Eastern cottonwoods have a short lifespan with minimal resistance to diseases and insects. The cottony seeds produced during the summer can trigger and/or exacerbate allergies. Plus, the tree has a relatively weak structure and is prone to breaking apart during storms. Mimosas adorn many commercial and residential properties and feature feather-like flowers during the early summer. But many people find mimosas quickly become a hassle given its tendency to develop disease and insect infestations. The root system is invasive and can cause issues with other plants and trees in the landscape. Silver maples share many unwanted characteristics with the eastern cottonwood, from weak structure to overproduction of seeds which fall each year. The roots are extremely strong and known for clogging and breaking water and sewer lines. White mulberry trees are known for their sweet berries, but also a number of problems. The roots are strong enough to crack pavement and other asphalt and concrete structures. Male white mulberry trees produce an inordinate amount of pollen that can aggravate allergies. Allow our trained crew to remove your tree safely and efficiently. By completing a thorough evaluation of the tree and surrounding site, we will evaluate each situation determine the safest, most efficient, and best way to remove a tree.